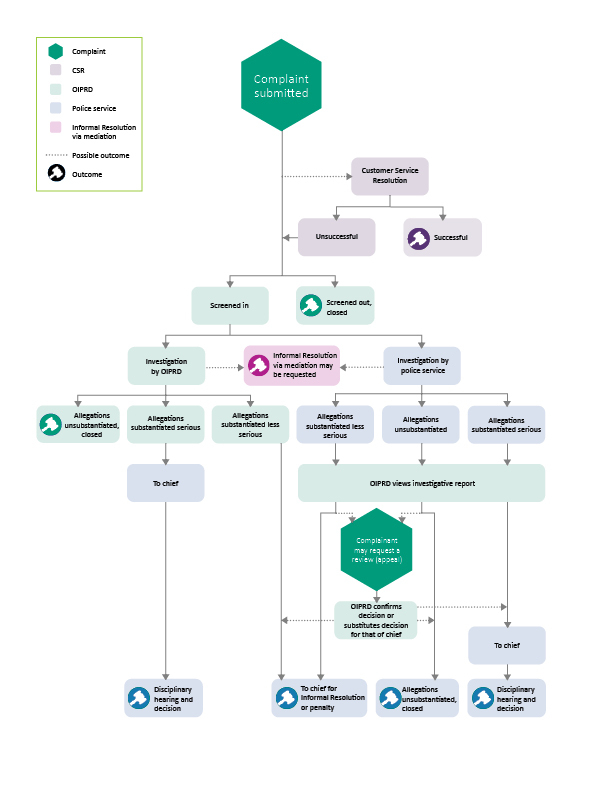 This chart is an overview of what happens, and when, in the public complaints process. Each complaint is looked at individually and is handled according to the Police Services Act, the OIPRD’s Rules of Procedure and the Director’s discretion. (b) At a police station or detachment and forwarded to OIPRD. Optional: Customer Service Resolution – Provides an opportunity for complaints and respondent officers to voluntarily resolve a complaint before it is formally screened in under the PSA. (b) If unsuccessful, the complaint proceeds to screening. (b) Complaint is screened out and closed. * Informal Resolution or Informal Resolution via mediation may be requested during investigation. (c) Allegations substantiated serious and sent to chief for disciplinary hearing and decision. ** Complainants may not request a review (appeal) of an investigation conducted by OIPRD. Complainant may request a review (appeal). (b) OIPRD substitutes decision for that of chief’s. (c) Allegations substantiated serious, sent to chief for disciplinary hearing and decision.